I can't find them on the BBB anywhere. Not a peep. I can find them on Yelp, but no where on the BBB, which is odd for a company that has been around as long as they have seemed to. Not a single complaint, not a single review of praise. You simply can't be in business for more than a decade and have ZERO BBB profile. No where do they identify ownership of the company. I know what you're thinking and of course I tried to search them under a different ownership or DBA name, but that's the thing. They don't identify themselves anywhere. For a company that seems on the up and up, this lack of identifying info is troubling to me. As I say, ResumeCorner.com has been around for a number of years, but the writers I spoke to say the only reputation they have is from many years ago. No one has heard of anyone working with them for many years, a couple thought they were out of business. They USED to have a good reputation back in the day, but again, this question of murky ownership rears its head. A free critique. Send in your existing resume, get it evaluated, and all this before even engaging them for their services. What they tout as "free bonuses" are really just packaged products like other sites offer, for example, ASCII versions of the resume, PDF, reference list, etc. A big red flag for me, when you go to order, you are directed to paypal. It seems ResumeCorner doesn't even have their own payment gateway. Again, this concerns me because it feels like the table stakes for being a "real" company is investing in a merchant account. Every other site we review here has a merchant account. I'd like to see samples of their work, but they only offered a grand total of... 2 sample resumes. That gave me pause as well. I guess their leaning more on the resume critique to show you what they can do, but still, most resume companies offer you dozens of samples, in order to judge their work. So, this gave me pause. Price is right in line with industry standards, and even a little on the cheap side, which is fine so long as their work is credible. 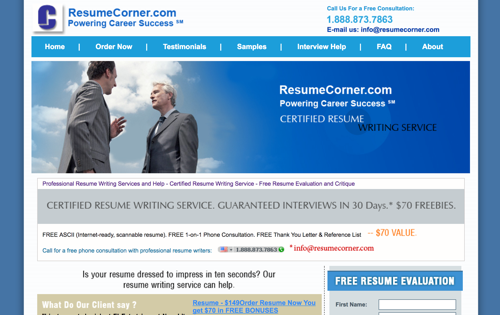 ResumeCorner.com is affiliated with the Professional Association of Resume Writers and career coach organizations.